Photo rejects, crappy photos, blurry photos. "I'm a trash photographer, but it's the camera's fault!" Perhaps the garden gnome is inside the aviary. LOL,as crappy and blurry as the pic is, it is nice in a twisted way :) the colours still look pretty. Love the original concept of your blog... very cool! A little out of focus but night colors. I love the crappy photo blog. This is hysterical! Oh, love the concept of this blog! A celebration of good intentions. i can clearly see that it truly is the cameras fault... bad camera !! It's so nice to see that I'm not the only one with a crappy camera! This is a really cool picture. 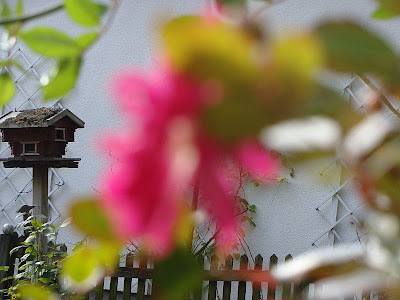 I like how unfocused it is with the little birdhouse, peeking through! I think the blurred blob adds a wonderful sense of mystery which is associated with the bird house. I could image it to be some exotic bird I've never heard of! :-) I like the shot! I like the "blop" of brilliant color in the picture's center. The birdhouse becomes the main subject. A fine, unusual presentation...I like! The picture is blurry but still it's cute. Keep posting! This is a riot! So glad that you posted on my blog about my hydrangea painting. If you crop the photo to just the blurry parts, it's actually quite lovely! this is funny....well I can see the house and color is lovely.. Cool crappy shot... I like it! Actually, I like your entire crappy blog. Very creative! Cool crappy shot... I like it! Actually. I like your entire crappy blog. Very creative! The leading online casino game provider in the field of gaming services from leading casino gambling sources. Golden slot We also offer a variety of online casino games such as baccarat, roulette, slots, slots, gambling, sports gourmet crabs and more than 200 online casino games, our service is open to you. You can use the live broadcast system with the people who provide services through the main website Gclub69 installed on your computer. With our system that is easy to use and ready to serve the needs of users in more than 10 languages, you do not have to worry about our service is in the standard of excellence. สล็อต The players who like to bet on the casino games online, we open it to make money every day. Because our gambling games can bet on the computer screen and mobile phones, just the device to the Internet. Many people who come to our games are very gambling. For those who are interested in our game, please join us for fun 24 hours a day. Would you like to be a contributor to Crappy Photo Blog? Send your request to Coca Cutie at: bumbumblog (at) yahoo (dot) com, and she'll promptly send you an invitation if she thinks you qualify.